As a nationally recognized leader in laboratory innovation, Precision Environments is a one-stop source for world-class design-build metrology lab environments. 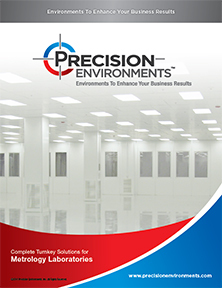 Precision Environments’ turnkey offering covers the entire laboratory implementation process from concept to certification. With extensive industry knowledge, Precision Environments delivers high performing laboratory environments that enhance your business results. Precision Environments, Inc. has been designing, building and servicing controlled environments domestically and internationally since 1989. Our design build lab capabilities are second to none in the industry and our team of laboratory experts deliver turnkey design build lab projects to hundreds of leading businesses across the globe. These turnkey projects include all disciplines of building technology including but not limited to architectural, electrical, mechanical and controls. Special developed wall systems, custom mechanical and control systems result in GUARANTEED performance of special laboratory environments required by our customers so that they can conduct their daily business efficiently. Precision Environments’ design build lab services deliver: precise temperature/humidity control, cleanliness, EMI/RFI attenuation, acoustic attenuation, vibration attenuation, ESD and other environmental factors that impact our customers’ business. Through our interactive design philosophy our goal is to provide Environments to Enhance Your Business Results. Our design build lab services have been delivered across the entire USA and the globe. We have delivered hundreds of custom design build lab solutions, working across many verticals, achieving the strictest protocols. ©2017 Precision Environments, Inc. All Rights Reserved.